This post includes affiliate links. That means that I am paid a small percentage of the sale if you purchase something using the link. However, that does not change the way I feel about these shirts. They are amazing and inspiring! Life....well it isn't always easy. It isn't always grand. It isn't always happy and it isn't always fun. Life is TOUGH. I get it. I can give you a run down of all the things that have happened in my life that are tough (and I will in a bit), BUT FIRST life is also wonderful. Life is a gift. Life is fun and an adventure that you never know where your day will take you. Life can be fun and very happy. Life is worth all the ups and the downs. If you have been around my blog for a bit then you know that I am REAL. I don't sugar coat things, but at the same time I try and be positive, inspiring, and uplifting. I hope that is the vibe you get when you come visit me on the web. If you have been around long then you know I love words and the power that they have. That is why I have words all around my house. I love wearing necklaces and shirts that inspire me and others. So today I want to share with you my latest obsession when it comes to words. 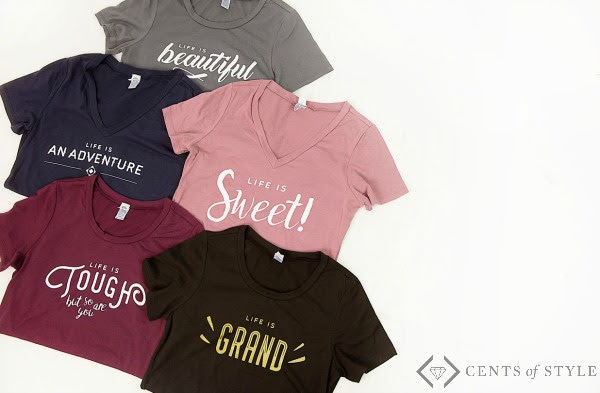 Introducing the "Life is..." collection from Cents of Style. Life is seriously each of these things, but I picked one shirt to be the shirt I would wear and I picked it for so many reasons. Do you want to see which shirt and picked and why? Alright. Let's do it! 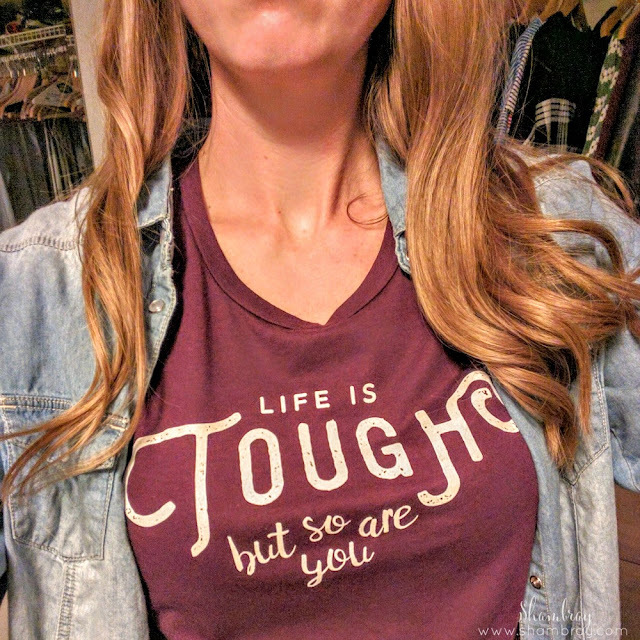 The number one reason was that this shirt went PERFECTLY with the theme of my "Happy Through Trials" blog series. If you haven't read any of the posts then you can start now and I promise you will be inspired by these amazing women! I went through a divorce. Surprise! MANY people don't know this about me. It is not something I am proud of, but it is something about me. I have to tell you a story as well. I VIVIDLY remember sitting at the lunch table with 4 of my best friends in high school and telling then that I NEVER wanted any of us to go through a divorce. It would break my heart and I felt that divorce was such a hard thing for someone to have to bear. Well out of all those friends I am the ONLY one that has gone through a divorce. It was very hard. However, I am tough! I made it through and although it wasn't the funnest thing I have done, I survived. I have had c-sections. This was another thing that I remember telling people I never wanted to do. And I have survived TWO C-sections. Do I wish I could have brought babies into this world differently? ABSOLUTELY, but guess what I survived. It hurt so very badly, but I am tough and I learned a lot through the process. I had pregnancies that I thought would kill me. With my first I threw up at least once a day, but sometimes many, many times a day. It never went away. I was throwing up everyday up until the day I delivered. With my second I was in the hospital for part of my pregnancy. Once again, it was very tough, but once again I am tough and I made it through. And once again there were many lessons learned. Post-partum anxiety has struck again in my life and it is not fun. I am still in the midst of this one, but once again I am tough. I am going to add something to my list that just happened. So this is not one of the reasons that I originally picked the shirt, but it fit with the theme. I set out to meet up with my husband for an anniversary celebration. He was going to take pictures of me in this shirt and while I was waiting for him outside the skies opened and dumped on me! I mean poured. I went running to the nearest building. It was ridiculous and our photo shoot was cancelled since the weather was absolutely nuts after that. Lovely, right? I wanted to cry, but instead I laughed. I guess the pictures will be coming soon. Lastly, I love this reminder. 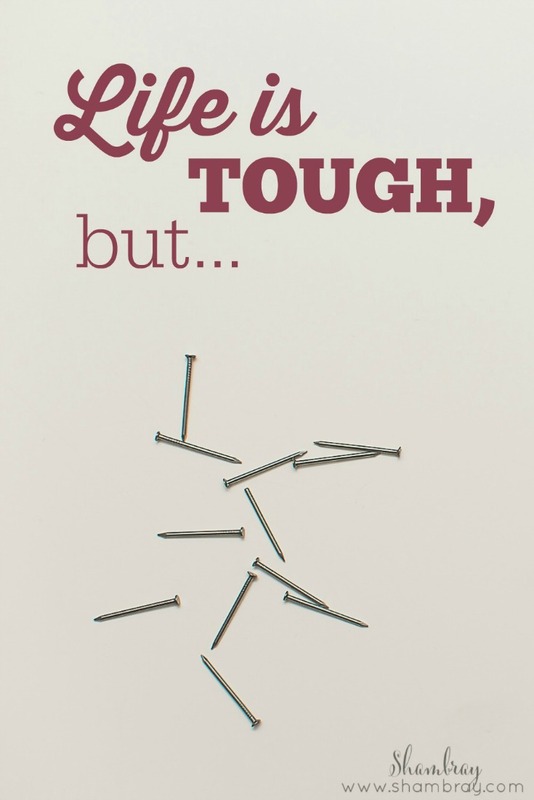 Women sometimes think they are not tough. That the toughness should be saved for the men in the world, but guess what ladies you are tough. You can get through whatever life has thrown at you. Most importantly you can smile through your trials. Maybe not 100% of the time, but everyday has at least one reason to smile. Don't ever forget that! I will end with this. I posted a picture on my Instagram account a little bit ago that said, "focus on the good". So I challenge all of us (me included) to focus on the good! 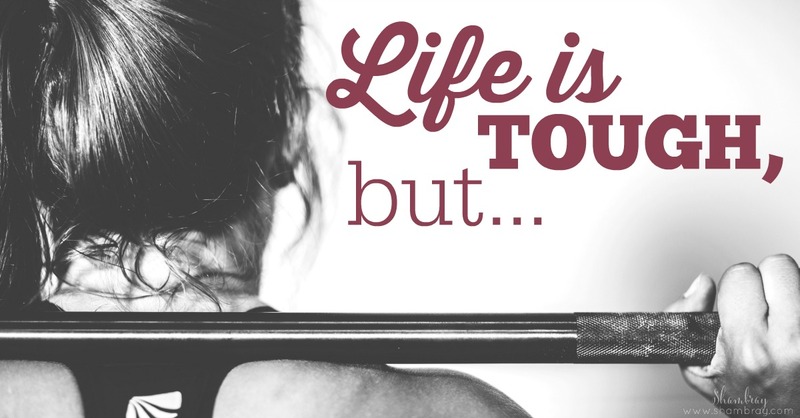 If we focus on the tough things or on the bad things in life that will not take those tough/bad things away. All that will do is rob us of the happiness we can feel if we focus on the good. Happy Friday! Enjoy your first weekend of Fall!